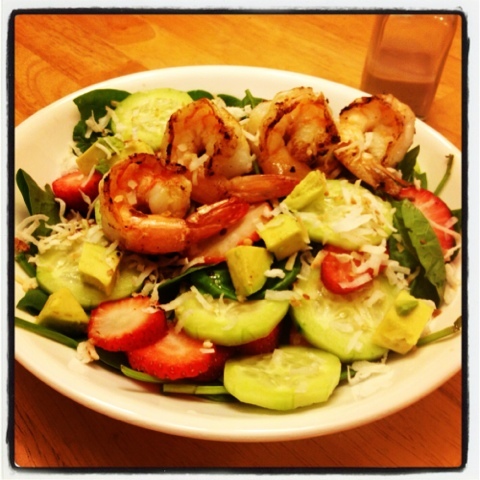 Hope you enjoy this healthy and delicious salad! 1. To make dressing first whisk together vinegar, olive oil, and mustard. Then whisk in the soy and lemon juice. Season with brown sugar, onion powder, garlic powder, salt and pepper. 2. Wash and peel your shrimp. Remove the tail. Add one tbs olive oil to grill pan and place shrimp in pan. Squeeze lemon juice over shrimp while cooking. Cook for approx 3 minutes per side. Shrimp will be pink when fully cooked. (We kept ours on a little longer because we like them more well done) Use your own judgement here! 4. Cut strawberries and your cucumber into thin slices. We try and keep them similar sizes for a pretty presentation. Cube up the avocado into small chunks. 4. Top spinach with all ingredients and pour 2 tbs sweet balsamic over top!